With a collection of global restaurants, a compilation of cookbooks to his name and his own TV show in his home country of Peru, chef Gaston Acurio can singlehandedly be credit for bringing Peruvian cuisine to the world’s attention. 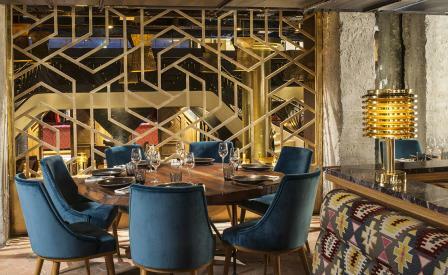 His latest opening is the eagerly-awaited Manko- his first Peruvian eatery in France. Named after Manco Cápac, Son of the Inca Sun God, the restaurant’s location on Avenue Montaigne in Paris’ Golden Triangle is particularly appropriate. Acurio’s convivial and generous personality is reflected in the wide oak tables encouraging groups of diners to order large dishes for sharing, while the kitchen is open and appropriately at diner’s eye level. The menu places emphasis on sustainably sourced fish, served as ceviches or tiraditos marinated in leche de tigre (lime juice, fish fumet, coriander, onion and yellow chilli pepper). There is also smoky charcoal grilled beef, accompanied by a selection of Peruvian vegetables including quinoa, asparagus, choclo (Peruvian corn) and yellow and purple potatoes. Afterwards, it’s just a short climb up the golden Art Deco staircase to visit the Manko Cabaret.